Home > Personalized Honey Favors > Personal Clover Round - 2 oz. Personal Clover Round - 2 oz. 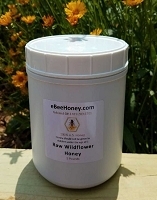 Round jars measure 2" high x 1-5/8" in diameter and filled with clover honey. 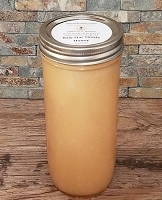 Clover honey in a personalized round jar. This is 2 oz. 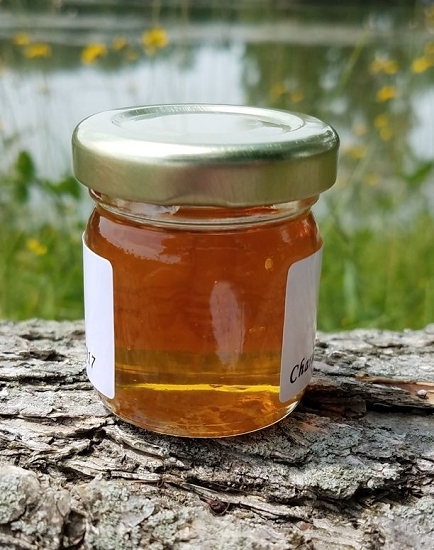 of honey by weight (45mL jar). Ebeehoney is awesome. They got my original order out when promised. 5 days later I was in a panic about having more guests than originally anticipated. So I sent email asking if I could get an additional 10. Without batting an eye, they processed the order,gave me a follow up email stating when it would be shipped and we were good to go. A very reliable, personable company yo work with. I nbn highly recommend them. 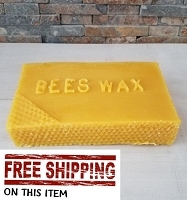 eBeeHoney.com is an amazing business! I ordered my wedding favors through my mother here and Becky was so helpful and quick with my order. 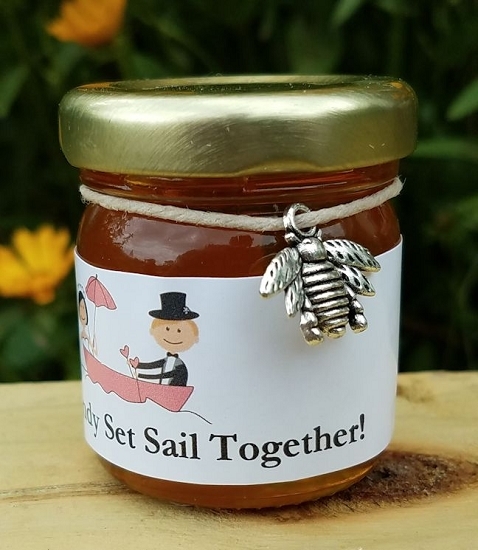 I knew I wanted to do honey favors for our farm/outdoor wedding, but everywhere I looked it seemed I would need to order all the pieces separately and things would be expensive, until I found this website. They offer any size, even multiple flavors of honey (we got the 2oz clover) I hadn't even realized could be option! They also offered different cute charms or different sized honey dippers ( we got 4 in dippers). The best part was, I was able to customize my own label for the jars. I just looked at all the options they had and listed them as clearly as I could in the comment box of the order. Within the very next day they had a mockup for me that was exactly what I wanted. 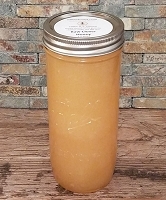 Then within 5 days the whole 110 jars, dippers and 110+ labels were shipped, and were at my door next day without additonal express shipping charges. Assembly was required for attaching the labels and the dippers but it wasn't a problem. Now they look absolutely adorable and exactly what I wanted. And considering how expensive honey can be, even buying it in bulk I truly believe we got a deal here. This place made ordering my favors both fun and easy. I would order from here again in a heart beat. Even if I am just looking for some honey for myself. If you need mass amounts of adorable honey jars for any event, order from here! They won't disapoint. 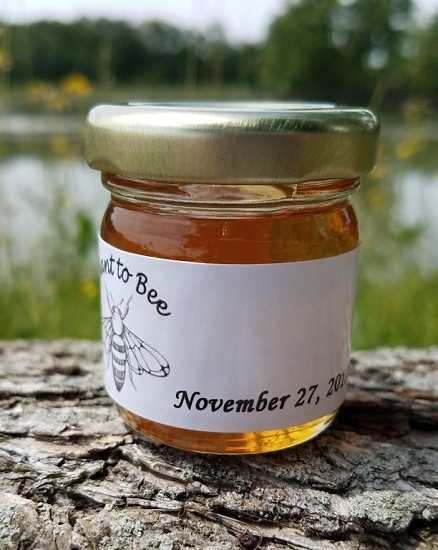 I was afraid we ordered too late for the bridal shower we wanted these cute little honey jar favors for..especially since we wanted a personalized label. I was so wrong, we had that order to us within a couple days, everything arrived just as described. Had the bridal shower this past Sunday, everybody just went on about how cute they were and such a unique idea. 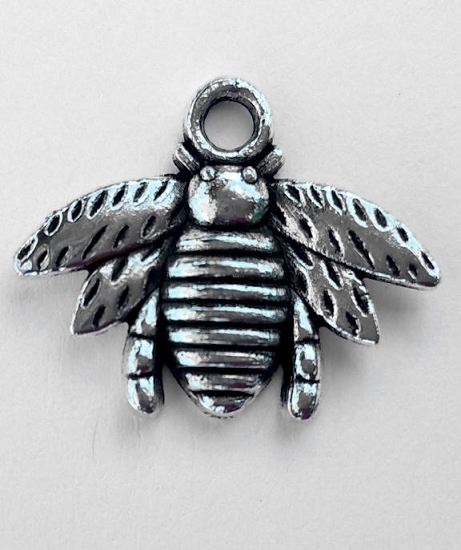 The "meant to Bee" was especially cute for the occasion. 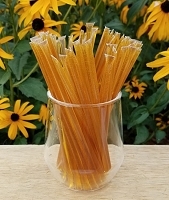 The honey is delicious, very mild and of course sweet. I am not a honey connoisseur so all I can say is it tasted great. 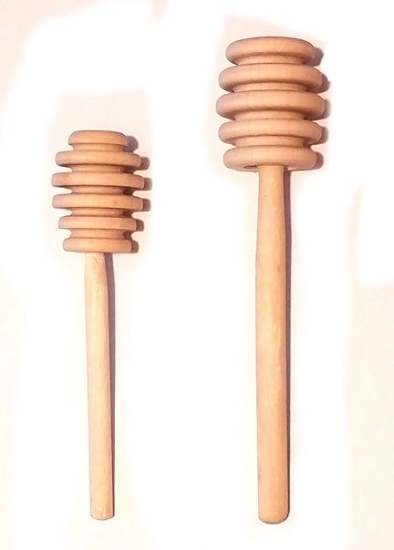 My daughter has ordered honey in larger volume from eBeeHoney and used it to make honey cupcakes...put little edible bees on top of the swirl...they weren't just adorable, they were scrumptious. The other thing is they were in contact with me as soon as my order went in...I didn't have to wonder for one minute if it was going to get done in time, when it was shipped, how the labels looked, when it would be delivered...I knew all this based on their consistent contact with me, they even made sure they instructed me on how to store it so it wouldn't crystalize. 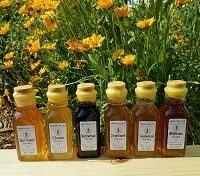 Would highly recommend this company, their honey and certainly their professionalism. 5 star rating, no doubt. Will order again from them. Sign me, a very satisfied customer...wish all companies had a work ethic like eBeeHoney. A great party and gift favor. I ordered the personalized one as return gift and it was a great hit on my kid's birthday party. Everyone at our daughters Bridal Shower loved these! Not only were they cute, but the honey was delicious as well! 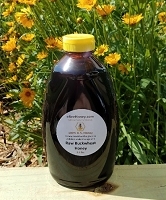 Communication from the seller, ebee honey, was super and the price was very reasonable. Highly recommend!! Glen and Becky were easy to work with, very timely, and very accommodating. 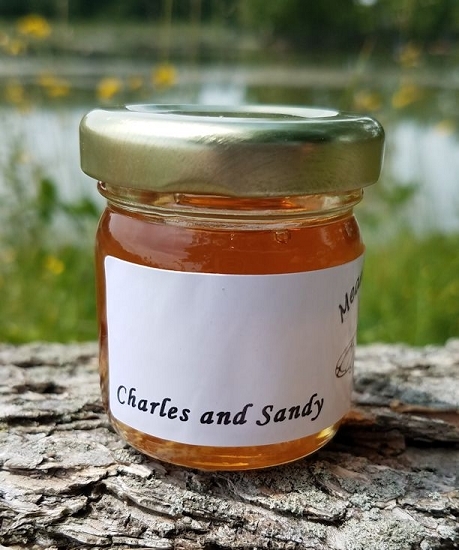 Their product is of high quality, and it is great to have people locally who are so passionate about their bees and honey. It is all natural and non-commercialized, love it! I highly recommend their service and product. Recieved the items in a timely fashion and they were all intact with no damage. Once I put the labels in, they were adorable and I can't wait to give them out at my reception! I will definitely recommend to friends and family! Super excited! Just received the personalized honey jars for my upcoming wedding to give out as favors. 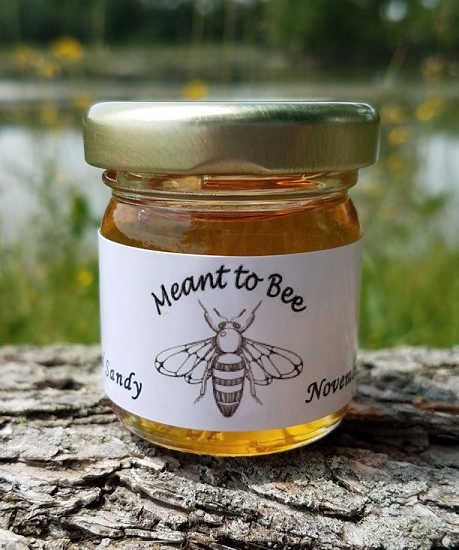 The labels are so cute and the honey looks yummy! Can't wait to get feedback from our guests. I will definitely recommend your company to others and I will be back to shop for myself as well. Thank you so much! I am more than satisfied with my honey jars. Labels came out just the way we wanted, and the jars were a big hit at the shower. My order came in just when they said it would. 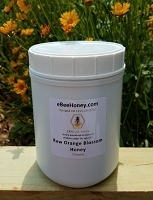 I would definitely use ebeehoney again, and will recommend ebeehoney.com to all my friends. My experience was wonderful! Ordering process was a breeze, label design was easy and I had a chance to see samples and go back and forth with designer until I was satisfied. Jars are cute and labels are adorable. Honey's good too :) Thank you! I absolutely love the honey jars! The labels were bright and exactly what I wanted. Thank you for doing a great job. Now I have a terrific favor for my daughter's Winnie the Pooh baby shower. 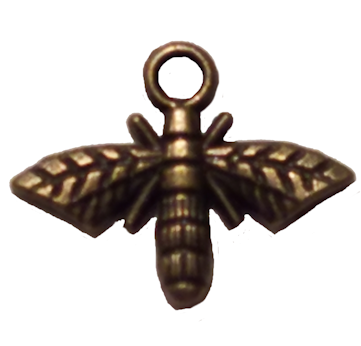 I am throwing a baby shower with a bee theme and am including these in a favor box. The people at eBeeHoney were fantastic. I submitted the design I wanted, but it wouldn't fit on the label, so they resized it for me and within days I had my order. The labels were perfect and I am thrilled with the result. Wonderful, prompt service! Nice product for a reasonable price. The 2 oz. jars of honey we gave as shower favors were a big hit. Thank you! 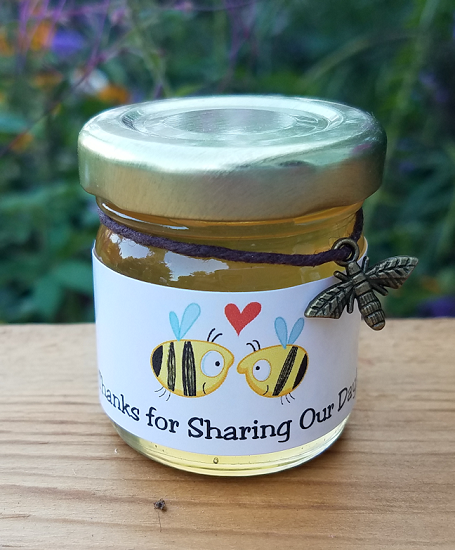 I couldn't be happier with the product and service I got when I ordered small jars of honey as a favor for a bridal shower I am hosting! Becky was thorough and attentive... to details and timing. She was patient and responsive to my many questions. 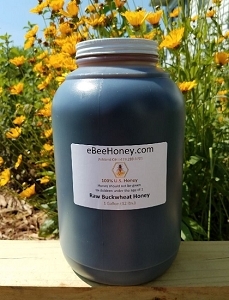 I have not sampled the honey yet but based on my experience so far, I definitely would do business with ebeehoney.com again and highly recommend them.